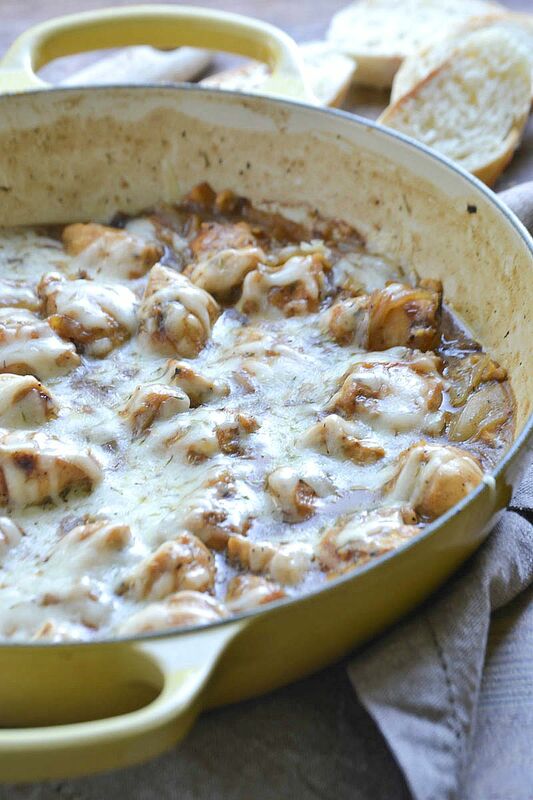 Chunks of chicken tossed in a thick french onion gravy loaded with sautéed Vidalia onions and melted Swiss cheese. This is great served over slices of french bread, egg noodles or rice. Years ago I was not a fan of French Onion Soup. It’s funny because it wasn’t that I didn’t like it, I just never tried it. One day I caved and finally tried it. It was life changing. Why did I wait so long to try a warm bowl of French Onion Soup loaded with tender onions, a thick slice of crusty bread topped with ooey, gooey melted cheese. Now it’s one of my favorite soups, especially in the fall. I love to make it on a cool fall Sunday while we are watching football. It’s just one of those classic comfort foods that never gets old. 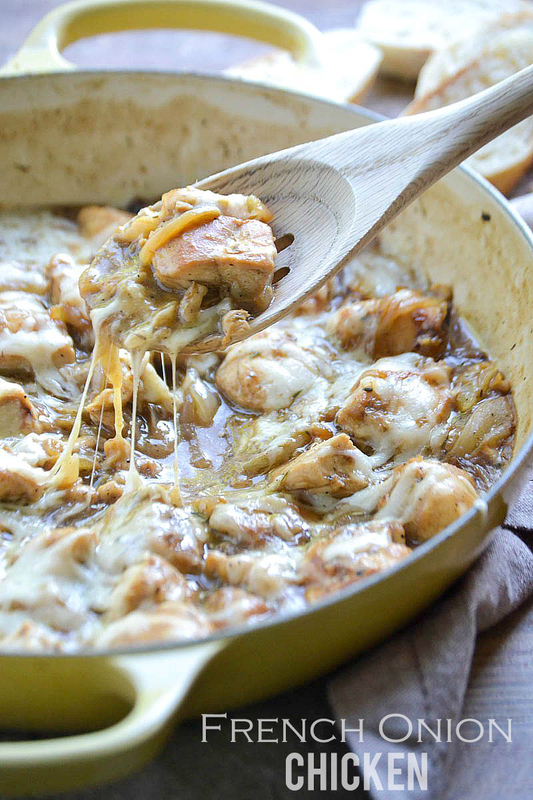 This French Onion Chicken has all the flavors of French Onion Soup combined into a yummy family-friendly skillet meal. My favorite way to serve this is over thick slices of french bread, egg noodles or rice. Instead of a soupy dish, I created a french onion gravy which really gives this dish that classic flavor. It’s topped with lots of shredded Swiss cheese and baked in the oven for a few minutes until the cheese is melted. When I caramelize onions or make French Onion Soup I love to use Georgia grown Vidalia onions, they are truly one of my favorites! They really add a lot of flavor and a touch of sweetness to any recipe. The sweet flavor that everyone loves about Vidalia onions actually started as a fluke back in the 1930’s during the Great Depression when farmers first planted these onions in fields in Southern Georgia. To their surprise the onions they planted turned out to be sweet instead of hot like regular ones. Now decades later, these popular onions are only grown in 20 counties in Georgia, only these sweet onions can be called Vidalia. The number of minutes of daylight during the winter in Georgia is part of why Vidalia onions are so sweet. If it doesn’t say Vidalia or have a sticker with the number 4159 it’s not a true sweet Vidalia onion. 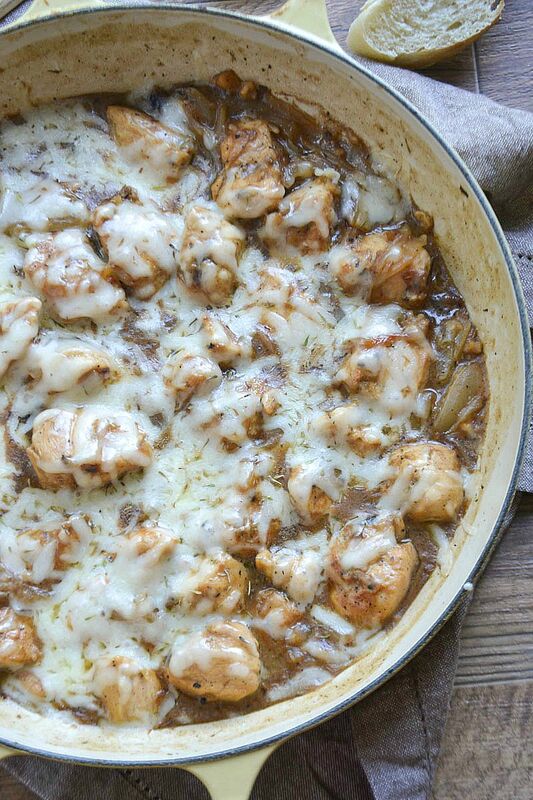 I hope you are craving this delicious French Onion Chicken because once you try it you’ll be wanting more! 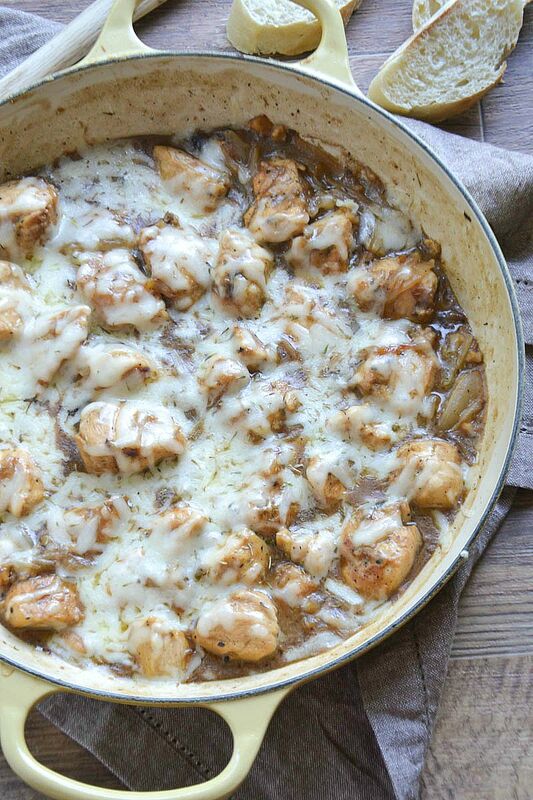 An easy recipe for French Onion Chicken. 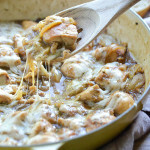 Chunks of tender chicken tossed in a thick french onion gravy loaded with sautéed Vidalia onions and melted Swiss cheese. Heat 1/4 cup olive oil in a large oven safe skillet over medium heat. Add chicken and cook until all sides are brown and cooked thoroughly. Alternatively you could serve over cooked egg noodles or rice. This is perfect for the colder evenings coming soon! I can’t wait to try it. What about using Gouda instead of the Swiss? Hi Dennis, Gouda would be a delicious substitute! This was an absolutely great recipe. I cut everything in half and it was perfect for my husband and me. Vidalia onions are not available at this time of year so I just used yellow onions and added a generous teaspoon of brown sugar ( a frequent ingredient in French onion soup). The onions carmelized beautifully and the taste was scrumptious. As my husband said- this is a keeper recipe! Lady, you are a master chef! Although every recipe can be improved upon, your idea is supeub! Actually, this lady has the hook up! ONGOING! Saw it! Wanted it now!! Had to improvise with red wine vinegar and Italian blend pre-shredded cheese because closest store is 30 minutes away! There’s goes the timer! Cheese melted this is devine!! Thanks!! A friend sent this to me, and I have to try it! I work part time at a Clubhouse for our Home-Owners Association, so I’m going to make this for my Manager to try, and hopefully, we will serve it as a Friday Night Special here Soon! Sounds Great!, and I can only imagine how it tastes! Just made this. We loved it! I love French onion soup but, I have never made it and was looking for a dinner to feed our family of 5. I saw this recipe and tried it and my family loved it so much and the kids all told me this is a must keep mom. I did add mushrooms and they took on the flavor and were a great addition to the recipe. But wow! what an amazing recipe. FYI Took the leftovers to work and now my co-workers want me to make a batch and bring in for a potluck lunch. Hi Mary, I’m so glad to hear your family enjoyed this delicious recipe! Thanks so much for taking the time to comment! Just made this! I subbed apple cider vinegar and a pinch of sugar for the red wine vinegar and served over egg noodles. It was a hit! Can you use sweet onions instead of Vidallia? I can’t find them anywhere at the moment! Hi Brianna! Yes, you can definitely use any sweet onion. It doesn’t have to be specifically Vidalia. Enjoy! Can you substitute in chicken broth and mozzarella cheese or white cheddar cheese? Hi Liv, you can definitely use chicken broth. I have never substituted the cheese.